The days of closing one eye and sighting down your thumb are gone. 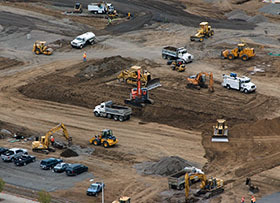 Site development requires exact location, elevation and grades throughout the entire project. Pihl uses lasers, laser guided machines, UTS and GPS guided machines to ensure this happens.